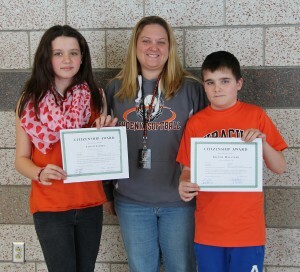 Emerson J. Dillon Middle School Dean of Students Raina Hinman presents Citizenship Awards to sixth grade student Sarah Thorn, left, and seventh grade student Trevor Halstead. 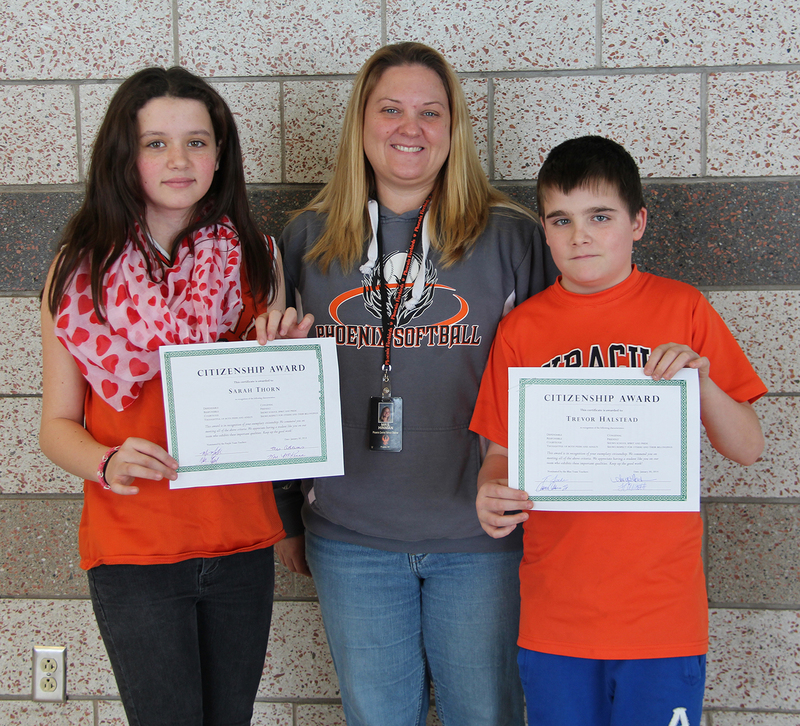 Sarah and Trevor are two of the only 47 students to earn the Citizenship Award honor which recognizes students for being exemplary citizens at the school. Forty-seven students at Emerson J. Dillon (EJD) Middle School in the Phoenix Central School District were honored recently for being exemplary citizens. Fifth grade recipients are first row, left to right: Thomas Uhl, Tabitha Clark, Miranda LaRobardiere, and Lily Roberts. 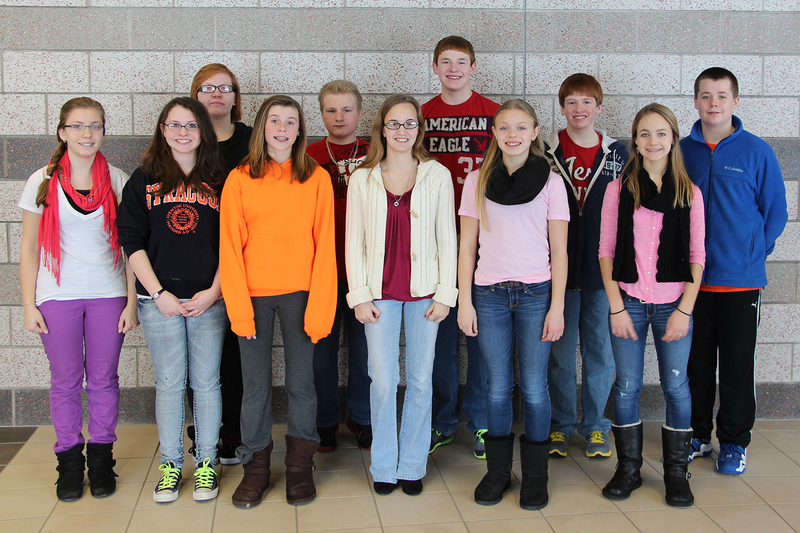 Second row: Chloe Calkins, Mattison Hess, Natalie Brown, Ethan Fox, and Noah Gordon. Citizenship Awards recognize role model students who are dependable, responsible, courteous, thoughtful of both peers and adults, congenial, friendly, and who show school spirit and pride and respect for others and their belongings. Students earning the distinction are nominated for the honor by EJD Middle School faculty members and receive a certificate of distinction as well as a copy of the nomination letter. 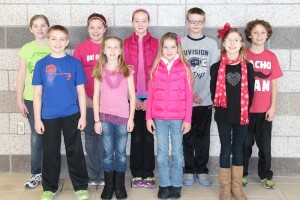 Fifth grade Citizenship Award honorees are: Natalie Brown , Chloe Calkins, Tabitha Clark, Ethan Fox, Noah Gordon, Mattison Hess, Miranda LaRobardiere, Lily Roberts, and Thomas Uhl. Sixth grade recipients are first row, left to right, Jillian Ricard, Madison Kalt, McKenna Squier, Savanah Neupert, Leah Schlachter, Darren Fischel, Cassadee Handville, and Cade Bacon. 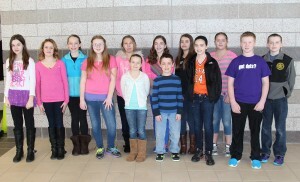 Second row: Trish Harris, Teresa Uhl, Hailey Goudy, Alexandria Mills, and Matthew Doane. 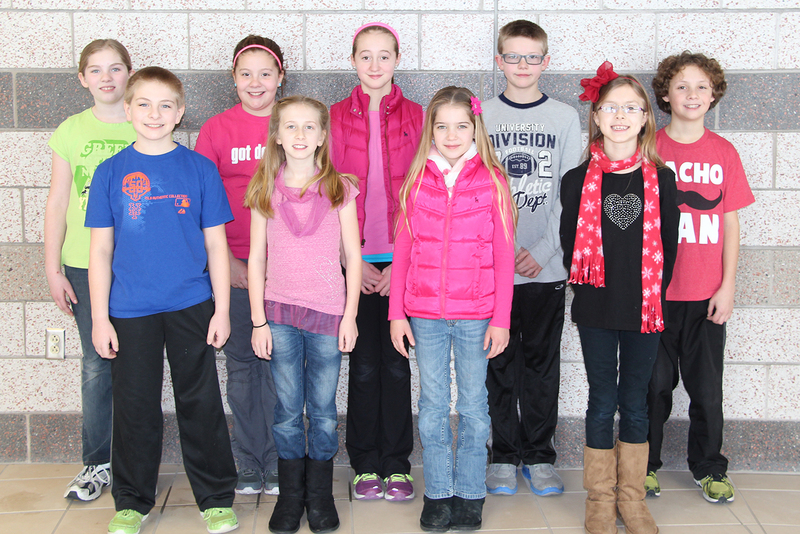 Sixth grade Citizenship Award honorees are: Cade Bacon, Matthew Doane , Darren Fischel, Hailey Goudy, Cassadee Handville, Trish Harris, Madison Kalt, Alexandria Mills, Savanah Neupert, Jillian Ricard, Leah Schlachter, McKenna Squier, Sarah Thorn, and Teresa Uhl. Seventh grade Citizenship Award honorees are: Gabriella Allen, Ashley Carbonaro, Trevor Halstead, Megan Hess, Emilie Hilliard, Lawrence Karl, Raina Knapp, Cole LaPine, Wendy Li, Ashley Margrey, Ross McFarland , Alayna Merrill, and Joshua VanGorder. Eighth grade Citizenship Award honorees are: Samantha Doupe, Veronica Gates, Morgan Gravlin, Natalie Hart, Alexandra Hoag, Joe Lacey, Breanna Mitchell, Alex Sisera, Jerrett Williams, Jordan Williams, and Julianne Yates. Seventh grade recipients are first row, left to right, Alayna Merrill, Joshua VanGorder, Gabriella Allen, Wendi Li, Ashley Margrey, and Lawrence Karl. 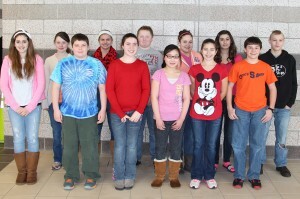 Second row: Ashley Carbonaro, Emilie Hilliard, Cole LaPine, Megan Hess, Raina Knapp, and Ross McFarland. Eighth grade recipients are first row, left to right, Julianne Yates, Veronica Gates, Samantha Doupe, Morgan Gravlin, Natalie Hart, and Alexa Hoag. 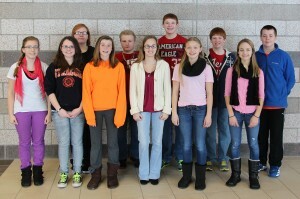 Second row: Breanna Mitchell, Joe Lacey, Jordy Williams, Jerrett Williams, and Alex Sisera.